One of my new year’s resolutions was to start making a living off my writing. To attain this goal I’ve advertised myself as a free-lance writer. Last week I got my first paying gig writing speeches for a prominent politician. 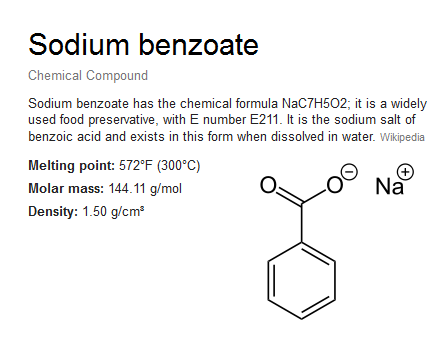 His name is Sodium Benzoate and he is a staunch member of the Preservative Party. As you know, Preservatives are in a host of foods, their goal being to keep food from going bad. Well, I wrote this speech for Sodium Benzoate, as an introduction to his upcoming debate with Entropy, the incumbent candidate from the Organic Party. Unfortunately, the Benzoate campaign has decided against using my speech. They did, however, pay me. Thus, I have fulfilled my new year’s resolution. However, I’m still dis-satisfied at not having my writing recognized. So here it is: the speech that never was. As a preservative, I believe strongly in keeping things the way they are. That means ensuring the future with a meal that isn’t rotten, decayed or spoiled. In fact, the opposite is true: the present will taste just as good as it does now for many years to come. If we select a Preservative way of life. That’s because, as a preservative, I believe in keeping things the way they are. Organic politicians, on the other hand, believe that the way forward is to abandon our roots. They want things to change, believing it will be for the better. I admire them for their hope and idealism, but the fact is that left unpreserved, most food will go bad in just a few days. I did not make the rules- but I do play by them. My fellow preservatives, we stand at a crossroads. Are we going to try our luck with some tuna that smells bad? Or are we going to stick with the can, the one that will be good for generations to come? The answer, to me at least, is obvious. Thank you. God bless. And God bless the United Contents of Refrigerator. I also wrote this attack ad for the Organic Party’s smear campaign against Mr. Benzoate. All these things need one thing. And that thing is not Sodium Benzoate. You are currently browsing the archives for the preservatives category.